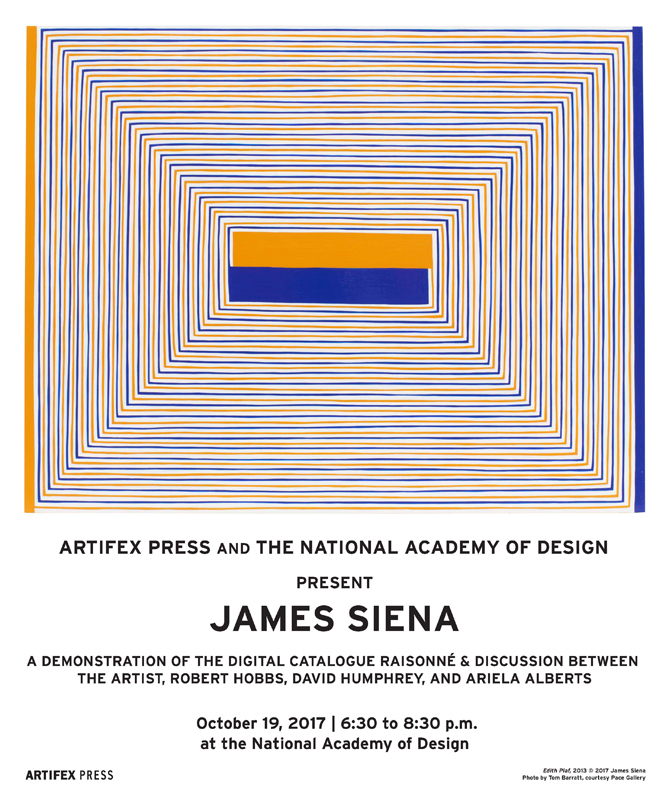 Please join us for a conversation with artist James Siena in celebration of the publication of his digital catalogue raisonné at the National Academy of Design in New York on October 19, 2017. To mark the public launch of the James Siena Catalogue Raisonné, Artifex Press and the National Academy of Design will host a discussion between James Siena; Robert Hobbs, Rhoda Thalhimer Endowed Chair Emeritus at Virginia Commonwealth University; artist David Humphrey; and Ariela Alberts, Editor of the James Siena Catalogue Raisonné, on October 19, 2017, at 6:30 p.m. The event features a demonstration of the digital catalogue raisonné, an in-depth discussion exploring the breadth of Siena's career, and an examination of the collaborative formation of the publication. The conversation will take place in the Salon Gallery, on the second floor of the National Academy. Doors open at 6:00 p.m. Please use the entrance at 5 East 89th Street. This event is free and open to the public. Please RSVP to rsvp@artifexpress.com.